Gone are the days of counting coupons to see how well people engaged with your brand’s marketing promotion. In a digital world, you no longer have to make educated guesses about which marketing tactics resulted in a brand success (or failure). Data from your customers and prospects is almost limitless. You can follow each and every digital interaction they have with your brand. But how do you figure out which data to use and how to interpret it to inform your future content? Content Marketing World presenters are here to help. Seventeen of them share how they use data not only to assess what did work, but also to determine what will work in their content marketing programs. Look at them on a weekly, month, and quarterly basis, and give them time to develop a narrative. I look at my search analytics report inside of Google Search Console to see what people are searching for to find my site (search impressions) and to land on my site (search clicks). Then I develop new content and flesh out existing content based on the keywords that show high impressions but low clicks. That means the opportunity is high yet my click-through rate is low, probably because I’m not serving the Google searchers well enough with my current content. One of the most underutilized sources of content gold is the search-bar queries from your website. Mine all the searches from your site and make more robust content for each one. I publish posts that serve as market feedback, asking my audience purposeful questions for their opinion. It also helps me learn what they’re looking for. From there, I can search deeper into the common answers that come up and create several pieces of content aimed exactly at what my audience is looking for. We constantly survey our users to understand what they need to be successful in their jobs in general and specifically when using our platform. Their answers guide what we write about and when we surface them either through marketing channels or even directly in our product. We focus on getting more mileage from our existing content, not just creating new content. We look at engagement with the content and impact on MQLs to determine what content we should resend to our market. We also keep an eye on persona engagement and version or create new content when we see a certain persona is particularly engaged or converting at a high rate. Your analytics can give insight into which pages you can (and should) improve. If you already have a library of content, it’s often better to spend time improving the content you have instead of only creating new content. Look at traffic, conversions, and organic search reports. Mix and match those results to understand which pages to optimize for search and which to do for conversions. You also can identify which articles to republish and which pages to link to more often. I love Andy Crestodina‘s tip about digging into your website analytics to find the keywords for which you rank on page two (spots 11-20). If those keywords align with strategic business goals, they’re a great place to invest some effort and track the results. We use analytics in real time to optimize campaigns as they run, so we don’t have to wait until the next post to make adjustments. With 100-plus articles published, you get great insight into what kind of content resonates with your audience, which topics have evergreen potential, and where you need to step up. You have to use your website, social, and newsletter analytics as part of a multi-angle view of the way your customers use and share your content. We also talk to our customers and customer-facing associates to inform future content decisions. 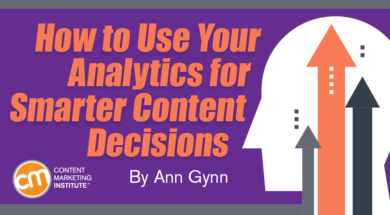 Everyone needs to expand their view of analytics and how they impact the business. We use analytics to figure out what content types to scale. We have a list of core topics – content types we’ve seen do well across industry verticals and role-based horizontals. When we see a certain piece or type of piece take off in terms of traffic, engagement, or shares, we test that topic type in a couple other markets. If it still does well, we scale it to all our coverage areas. I don’t use analytics to inform my future content. I do multivariate testing for email subject lines. If one of the first subject lines I test performs especially well, I’ll use that to adjust the current and future content to better reflect what topic people want to read. We evaluate content conversion metrics such as form fills (registration-form completions) to help guide what and how we promote content. We also use this guidance to help us develop “big rock” asset ideas based on compiled pieces of high-performing content. This allows us to stitch together useful and high-performing content for persona targets, industry targets, and business segments. We’ve recently been focusing on conversion optimization on our B2C side. We’re testing to see which kinds of content drive which KPIs. Our amazing senior audience director plays the role of principal investigator/instigator in these growth-hacking experiments. She’s in California and I’m in New York City, but I imagine she’s wearing a white lab coat to work. Data is a commodity. Information is a liability. Insight is an asset. Without truly looking for the insight hidden in the data and information, data alone can be misleading. We use data to help find the hidden truths behind our customers’ intent, and we leverage that insight to accelerate growth.